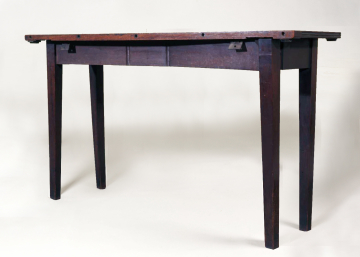 Table, XF73, English, unknown maker, early nineteenth century, mahogany and brass. ©Sir John Soane's Museum, London. Photograph: Hugh Kelly. This is probably the ‘Part of an old mahogany dining table’ which is listed as being in the Monk’s Cell behind the Monk’s Parlour in 1837. It is listed as in the ‘small room’ which formed part of the Cell, which had at one time contained a bed. It is probably the ‘extra section of the dining room table on four legs,’ which is listed there by Summerson in his card index of the furniture, compiled in the 1950s. Although it is clearly a made-up piece, both sections of which have had more than one previous use, the reeded section of the top is a leaf from Soane’s dining room table (XF262) – it is the same width, 4 ft 1¾ inches but is narrower than the other surviving leaves. Its colour is much darker but this may be the result of its having been stored in dark spaces. The table may have been the response of Robins to a last-minute plea from his good friends the Soanes for some kind of table large enough for their first Christmas in their new home.